Our development team recently made the switch from Hipchat to Slack for team communication. Previously, we had a few integrations with other tools we use, such as BitBucket and Bamboo. There were also a few new ones that we wanted, like the one I’m going to walk you through today. Back story: Over the past year or so, I’ve been working on an [agile] project management system, that my team is currently beta testing. We often reference tasks (and user stories, etc) in chat. This usually involves a user finding the task and then copying and pasting the URL in chat. This is fine and all, but for such a repetitive task, I thought it helpful to have a bot do this for us. A sample message to “collabot” might look like: @collabot: get task 2016-01-0101, where “2016-01-0101” is the task number. To start, you need to create your integration for your new bot. To do so, go to _http://.slack.com/apps/build_ and choose if you want to develop for "everyone" or "just your team." For mine, I chose just my team. 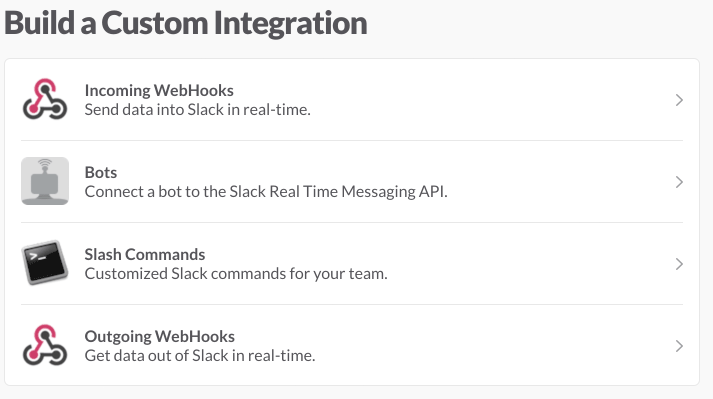 As you can see, there are a few types of integrations one could build for slack. For our purposes, we'll choose "bot." When you click on “bot,” you’ll be asked to create a name for your bot. For mine I did “collabot” (it’s a play on the name of our agile system). Note that you can change this later, and I did a few times. From there, you’ll be taken to the final screen where you’ll see your API token (this is important, but keep it safe). You can also change your bot’s display name, and icon. For purposes of this post, I’m assuming you have Node.js and all the related necessities (NPM etc) installed and ready to develop. to initialize your new project. Node will walk you through a series of questions to get your project set up. Default options will show in parenthesis, and at the end, it will show you what your package.json will look like. You can always change these later by editing the package.json file. “Botkit” is the library I chose to assist in interacting with Slack’s APIs and “request” is used for making the HTTP requests to the project management app’s API. Be sure to include “–save” so that the package gets added to your project correctly. Now, for the fun part – the code. The majority of the magic happens in collab-bot.js. I’ll highlight the main parts of it, but leave the rest up to you, since each use-case will likely be different. Here, we’re essentially using require to bring in our dependendencies, and then setting up a controller for Botkit. Finally, a simple constructor that our app will call and pass in the settings for our bot. The run method is where [most of] the magic happens. To start, we’re telling our controller (defined above) to “spawn” an instance, passing in our API token via settings. Then we’re using .startRTM() to use Slack’s Real Time Messaging API. Next, we want to tell the bot what to listen for. In my case, I only want it listen to direct mentions. I am using a regular expression to make sure the message starts with “get task” and then I’m using the last part as the task ID (this looks something like “2016-01-0123”). Because the AJAX call is asynchronus, and for readability, I’m defining my callback method which calls my API (in a later method) and then formats the message using the response from the API (redacted) and sends it to bot.reply(message, replyText). For purposes of brevity, I’m not including any of my code to make the API calls for getting data, but all of that happens in _getTask(). To start, we’re simply using require to “include” CollabBot. From there, we’re defining the settings our bot needs to run. Most of these are for my API specfiically, but the required one for any bot will be the token, which is your Slackbot’s API token (from above). I’m then instantiating a new CollabBot, passing in my settings object, and then calling .run(). Overall, the process was pretty straightforward. My colleagues and I have been talking about many other ideas for bots to built as well as various integrations. Although not everyone agrees, Bots do make things a little faster and simpler, as they enable you to automate repetitive tasks. Have fun bot-ing! Share what other bots you’ve made (or use) in the comments below. PS. Interested in Collab? Get in touch to see if you’re a good fit for beta testing!